Mount Shasta might be the crown jewel in Siskiyou County, however, there are untold treasures and hidden gems waiting to be discovered throughout the vast landscape. From uncharted tunnels and caves to rivers and overflowing waterfalls, unassuming parks and trails, a journey through Siskiyou is an adventure you must experience. Join me in discovering these 9 hidden gems throughout Siskiyou County. Disclosure: This post is sponsored by DiscoverSiskiyou.com @SeeSiskiyou. All opinions and content are my own. Greenhorn Park is home to a nice reservoir, several miles of easy hiking trails, and a great spot to picnic and watch the sunset and wildlife. Located a mere 1.5 miles off the I5, this easily missed location is well worth the stop if you are seeking a low-key relaxing place to hang out at. You’ll find some interesting non-standard park items here, such as horse shoe pits and gold mining equipment near a ghost town. All in all this park is peacefully exceptional. Before I headed to the park to catch a sunset, I stopped at Miner St Meat Market in Old Town Yreka, grabbed some snacks and beverages, threw them into my Yeti portable cooler, then headed over to Greenhorn Park to enjoy the sunset. There is a healthy goose population, so I refrained from spreading a blanket on the grass, but I did find plenty of tables to choose from. Directly off Highway 97, 13 miles from the town of Weed, the Living Memorial Sculpture Garden is home to meandering trails over 136 acres with iron sculptures of various scenes inspired by American armed forces. Mount Shasta overlooks the garden in the distance, with plenty of beauty at every step. Trees throughout the land have been planted by volunteers to serve as a living tribute to those who have sacrificed their lives during times of war. The original concept in 1987 was to plant 58,000 trees to represent each American service person killed during the Vietnam War. To date, more than 90,000 trees have been planted. The sculpture garden itself is meant to be a place to relax and meditate, with various scenes representing the many facets and emotions which come with war. A memorial wall stands in the parking lot, where new names are added on each Memorial Day and Veterans Day. Despite the remote location, the grounds are beautifully maintained and are a must-stop for anyone in the area. The sculptures and art have a way of moving you and bringing about many moments of reflection. I’ve been to many different memorials and sculpture gardens – this particular one is quite unique. Pluto’s Cave is a lava tube which extends a bit more than a mile underground. While the first thousand feet have varying amounts of light, a headlamp or good flashlight with extra batteries is required to proceed further. The trail and cave is a combination of sand, rough lava flows and cinder cones. Portions of the lave tube have collapsed, with light filtering in from holes above and rocks to climb over as the trail continues on. The beginning portions of Pluto’s Cave have graffiti and small rock circles for campfires, despite being forbidden (as well as food and drink to protect the fragile underground organisms). If you look carefully, markings made by explorers in the early 20th century can be found deeper in the cave. This is a great cave to explore for beginner cavers or casual adventurers, as it doesn’t require crawling or squeezing through tight spots – merely good lighting and gumption. In getting to Pluto’s Cave, you’ll want to make sure you don’t make the same mistake I did. I searched for it on Maps, clicked the icon, and then Navigate. This routed me though the most “direct” way, which is through a remote neighborhood up and down steep dirt roads and homes which very apparently do not want outsider traffic. Instead, make sure to navigate to road 43N30, which has a sign for Pluto’s Cave. Turning onto 97, the road is 3.2 miles north of 99. Follow the dirt road, one portion which has deeper granite sand, until you reach a small parking lot. Parking is free. There is a marked very obvious trail which will take you to the caves. The trail from parking lot to cave is less than a mile. This is great rattlesnake habitat, so watch where you are stepping and don’t stick your hand in nooks and crannies for fun. As you walk towards Pluto’s Cave, you will find really beautiful views of Mount Shasta, the Whaleback, Herd Peak, Sheep Rock, and surrounding ranches with their old and twisted Juniper trees. Regaining the low ground at the base of the mountain and holding on in your grand orbit, you pass through a belt of juniper woods, called “The Cedars,” to Sheep Rock at the foot of the Shasta Pass. Here you strike the old emigrant road, which leads over the low divide to the eastern slopes of the mountain. In a north-northwesterly direction from the foot of the pass you may chance to find Pluto’s Cave, already mentioned; but it is not easily found, since its several mouths are on a level with the general surface of the ground, and have been made simply by the falling-in of portions of the roof. Far the most beautiful and richly furnished of the mountain caves of California occur in a thick belt of metamorphic limestone that is pretty generally developed along the western flank of the Sierra from the McCloud River to the Kaweah, a distance of nearly four hundred miles. These volcanic caves are not wanting in interest, and it is well to light a pitch pine torch and take a walk in these dark ways of the underworld whenever opportunity offers, if for no other reason to see with new appreciation on returning to the sunshine the beauties that lie so thick about us. John Muir, “Shasta Rambles and Modoc Memories”, Picturesque California and the Region West of the Rocky Mountains, from Alaska to Mexico (1888). In between exploring all of these hidden gems throughout Siskiyou County, you’re going to want to hydrate. 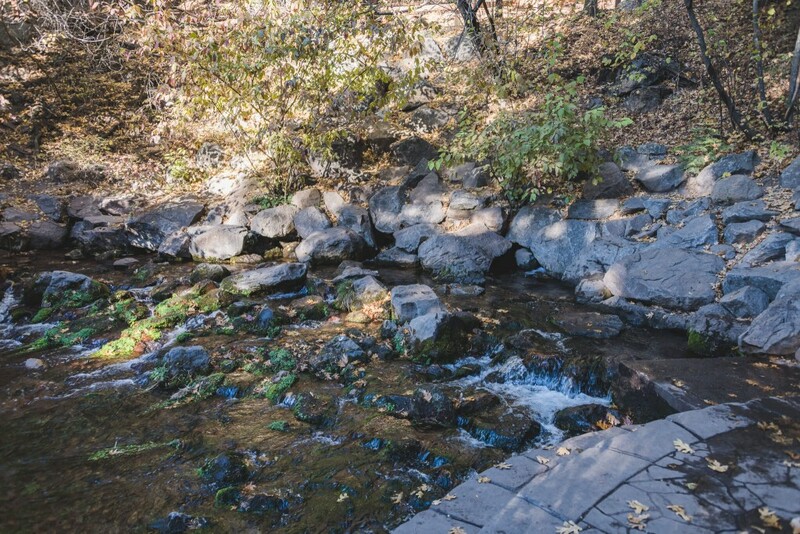 A stop at Mount Shasta City Park will bring you to the Sacramento Headwaters. Water emerges from this spring after filtering through granite for more than 50 years via the Big Springs Aquifer, a volcanic aquifer below the Mount Shasta area. Testing has shown the water to have a flow rate of 420 l/s an average temperature of 6.8 °C, a pH of 6.71, a siO2 concentration of 53.4 mg/l, Calcium concentrations of 3.7 mg/l of water, and a Mg concentration of 3.18 mg/l. Plenty of people fill their water jugs, water bottles, and other containers from water directly from the spring’s source. Officially, there is a sign warning that the water has not been tested and is not safe to drink. However, I am fairly confident this is a legal thing and not indicative of actual water quality. Plenty of folks, myself included, have been drinking these waters for many years or decades without issue. Wading or swimming is strictly frowned upon, in the interest in keeping the water pure. If you want to try the waters but feel more comfortable filtering, this filter will serve you well. Considering how big the delta is before it enters San Francisco Bay, it is pretty cool to visit the location where the Sacramento River starts. The park itself is pleasant to explore, with trails weaving around the headwaters and across small bridges. To get here, navigate to the Mount Shasta City Park. Keep to your right and you’ll get to an area which has parking along the shoulder. About 160 feet later, you’ll find yourself at the headwaters. Take it in, try the water, and know that you just did something really cool and unique not many people in modern society get to do. Castle Lake is a spot which is not only a hidden gem in itself, but surrounded by other treasures of Siskiyou County. Nestled in the Trinity mountains, southwest of Mount Shasta and North of the Castle Crags, this glacial lake is quite picturesque any time of the year. Trout fishing, bird watching, kayaking, star gazing, row boating, rafting, and swimming are all activities to partake in during the warmer months. During winter, snowshoeing and ice fishing are very popular activities in the Castle Lake area. One moderately strenuous hike includes climbing up the granite to Heart Lake, where the above image was taken from. The trail starts on the left side of the lake and takes you long the water’s edge before going quickly ascending through a wooded pathway. Careful footing over old root systems and pacing yourself are key at this point. This 3 mile hike showcases nonstop vistas and changing perspectives of Mount Shasta, Castle Lake, and the surrounding areas. Many consider the summit of this hike to provide one of the best views of Mount Shasta. As the trail moved up beyond the wooded area, the trail splits and spreads into multiple pathways over large slabs of granite – choose and keep an eye on where you want to eventually end up as the paths merge with each other at the end. From Heart Lake, you can continue just a bit farther to the top of the peak just South of Heart Lake, you will be rewarded with views of meadows, Castle Crags, Mount Shasta, and depending on visibility, Mount Lassen, Crater Peak, and Burney Mountain. I wasn’t able to make this last stretch during my recent trip due to hiking at sunset, however, I plan on returning in spring and redoing this with the intent of overnight backpacking. The Pacific Crest Trail is a mere half mile away from the top of the vista, which would be a pretty awesome stretch to add to my experience. The star gazing from Heart Lake and beyond is incredible. It is not terribly high in altitude, yet far enough away from light pollution to provide spectacular views of the galaxy with the lights from the city of Mt Shasta in the distance. Back near Castle Lake, another short hiking trail will take you to Fairy Falls and Ney Spring Creek. Roughly 1.5 miles out and back, this is an easy 45 minutes trail. You will be rewarded with discovery of the ruins of Ney Springs Resort and a beautiful waterfall which fans out as it descends over the rocks. The Ney Spring trail can be tricky to find initially. The parking lot for this trailhead is a turn before you arrive at Heart Lake. Driving up Castle Lake Road, turn left onto Ney Springs Rd. Park at the first turnout on your left. Begin your hike by walking up the road to the right. If you walk to a bridge, you have gone to far, as there are no trail markers. Walk towards the right and the creek will be on your left. When you find the ruins from Ney Springs Resort, know you are getting close to the waterfall. When the trail begins getting steep, veer to your left, climb down the rocks you will have arrived at Fairy Falls. Lakin Dam was originally built in 1926 by the McCloud River Lumber Company. This tiny unassuming picnic spot is accessible down a maintained dirt road not too far from the McCloud Falls. The dam slows down the McCloud river enough for the native Redband Trout, which are easy to spot as you meander along the river’s edge. The area is simple and quiet, with a bathroom and small concrete pad with a couple picnic benches. If you are feeling adventurous and desire some extra walking, there is a river path which takes along the McCloud river from the dam to the Upper McCloud Falls and all the way to the Lower McCloud Falls. It’s about a 5 mile hike, with some switchbacks in the middle, but otherwise flat. You will be rewarded with some beautiful views and plenty of flowers and birds. In getting here, Maps may want you to cross a bridge which could be closed due to lumber activities or other reasons. Starting from the turnoff to Upper McCloud Falls, continue until you get to a 4 way split in the road. Go right, drive 0.3 miles, then make a left. You may or may not notice a sign for Lakin Dam. Continue until you reach the parking lot. McCloud Falls features three different falls – Upper, Middle, and Lower. Each tier of waterfall has a parking lot and short walk to viewing platforms. You can also walk the River Loop Trail to each fall. I’ve visited these falls on numerous occasions over the years. Whether you go during Spring when the river is roaring from snowmelt or during Fall as the water meanders and cascades, the falls fill your being with a sense of tranquility. Getting to Upper McCloud Falls is as simple as parking in the paved lot then walking a short distance to a viewing platform 90 feet above the falls. Water jets out of a small opening and opens up like mainy named fairy or feather falls throughout the United States. This is not a recommended swimming spot, as it is dangerous to climb up or down the basalt rocks here. Middle McCloud Falls is considered to be the most appealing of the three falls, based on its massive flow, at 50 feet in height and over 100 feet across. There are swimming holes and fishing spots, stocked with trout in the summer. To view the falls from above, the easiest way is by using the parking lot. If you want to hike down and view the falls from a different perspective, park at Lower McCloud Falls or Fowler’s Camp and find the trail leading down. I accidentally took a shortcut and didn’t quite get to the official trail for the first part of the hike down. By the way, if you want the secret to getting epic shots like the one I took up above, you’re going to want a Neutral Density filter. Check out my post on Photography Gear Upgrades for more info. The Lower McCloud Falls are 15′ in height, with a massive area to swim in. Temperatures in this pool average about 50 degrees, so I hope you can swim fast! The rocky area to the left of the falls is popular to hike along, with a stairway leading down to the water’s edge for easy access. About half a mile farther down from Lower McCloud Falls, there is a spot to put in a kayak and make your way to the McCloud Reservoir. Hedge Creek is a very short walk off the road – 0.7 miles to be exact. Park across the street, head into the park, and stop to drink at the water fountain before heading down. This is some of the cleanest water in the world. Take a moment and enjoy it! Hike on down and you will find a tiny waterfall about 35 feet tall. However, what makes this so fun and unique is the ability to walk behind the waterfall. Think of the cool social media photos you can get with an opportunity like this! 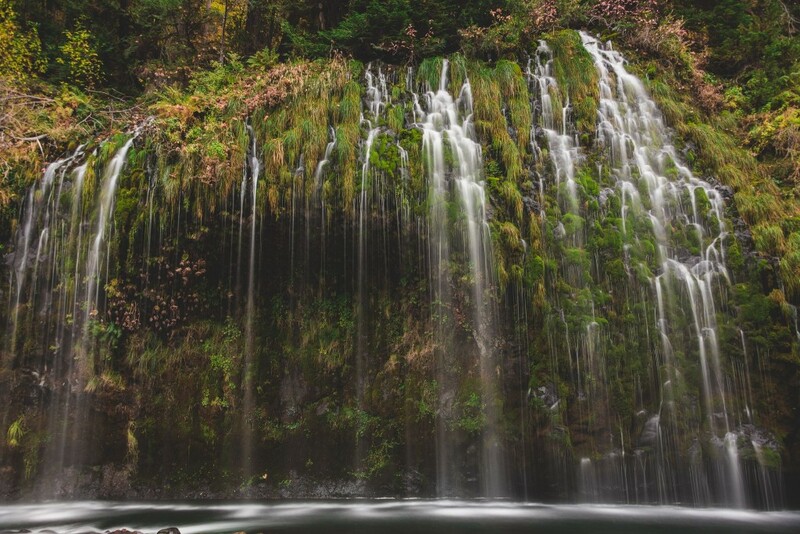 Mossbrae Falls is the ultimate hidden gem. Technically trespassing. Technically not allowed. So, let me just say, do not go here. Don’t carefully walk along private property carefully for 2 miles, parallel to the Union Pacific train tracks, watching for trains and making sure to give them plenty of room. But seriously, if you choose to visit these incredible falls, know that there is a potential $300 fine, and there are records of deaths from people not watching for trains. There is another pitfall – parking. Access is through a private community. While they do not mind pedestrians, you must find parking outside of their community. Failure to do so will result in a towed vehicle, before you can return from your hike. That said – Mossbrae is incredible. The falls span hundreds of feet. Much of the flow is hidden behind the flora, but you will see about 50 feet in height and about 175 feet across. Fun fact: Moss + Brae is named due to lot of Moss on the hillside at this waterfalls site. In Northern Irish and Scottish languages, Brae means ‘a steep bank or hillside’. As you walk along the railroad tracks to the falls, you will eventually come to a bridge. Right before the bridge you will see a rock and mildly hidden trail down to the river. Head down the trail on the right and in a few steps you’ll be at the falls! To start: Park somewhere on Dunsmuir Ave where parking is allowed. Walk down Scarlet Way down the hill of the Shasta Retreat Community. Keep going from Cave Ave across the bridge to Simpson Ave. As soon as you cross bridge, follow the trail on the right of the train tracks for 1 mile. Make sure to remain alert for trains and stay off the tracks. Wow, your photos of Castle Lake are stunning! I’ve never been to that particular area of Northern California, but now I totally want to! What a gorgeous location! Amazing pictures and great writeup of these hidden gems. Would love to check out Pluto’s cave and those falls. Ahh you are tempting me to come back to the US ASAP! So many hidden gems, I would love to go hiking there sometime. What beautiful experiences in nature! Although I know about Mount Shasta, I’d never heard about these other marvelous areas! I’d love to spend time exploring the waterfalls, visiting Pluto’s Cave, Castle Lake, and Heart Lake. What a glorious adventure! Very beautiful photos. Thanks for sharing! So many gorgeous places to explore. I really love the falls and the sculpture garden. There is something about seeing art nestled among the art of nature that I find inspiring and soothing. Those are some incredible pictures! Really makes me want to travel there! I can’t get over how stunning Castle Lake is. I love the idea of the living memorial garden to honor our fallen from the Vietnam War. Thanks so much for sharing, these are definitely hidden gems, I had never heard of any of them! Wow what an incredibly comprehensive post! I loved the part about Pluto’s cave. Thanks so much for sharing!